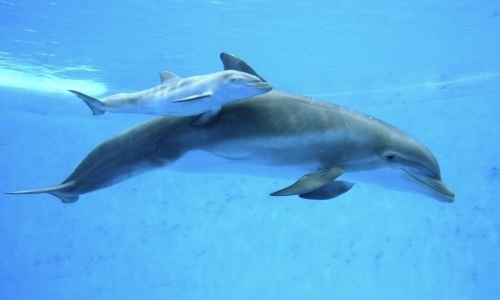 Dolphin mothers have very complex teaching habits. At first, their young depend totally on them to develop and learn everything they need. Human mothers know the integrity required to teach their child to walk. Although dolphins are born knowing how to swim, at first they can become a little insecure and it is important that they have their mother's upbringing to develop confidence. The gestation of the bottlenose dolphin lasts about 12 months. Six hours after the birth, the mothers begin to breastfeed their young with colostrum that provides antibodies that help protect the young during the first hours of life. Then, during the first months of life, the mother will breastfeed at least four times an hour during the first 4 to 8 days, until two years after birth. Milk is very rich in fats and all the nutrients that breeding needs to develop healthily. Once they teach calves the basic rules for survival, the dolphin mothers ensure that there is always effective communication so that they can grow healthy and succeed once they are integrated into their pods. While that happens, mothers and calves spend every moment together, although from time to time their pod intervenes to help in the breeding process. Delphinus knows that witnessing and studying the maternal face in the life of a dolphin is an incredible and invaluable experience. For this reason it has maintained a high reproduction rate since 1992, when the first dolphin breeding Tonina Tursiops Truncatus in Mexico was born in its facilities, which gave rise to the Delphinus' Breeding Program. Our experts take special care in newborn babies; they receive attention 24 hours a day for at least two months. In fact, in 2009 Delphinus entered the World Book of Guinness Records for registering the highest number of births, all in the Delphinus Xcaret habitat. The knowledge obtained when investigating dolphins, including their reproductive stage, provides valuable information to promote the conservation of this and other species, like the Vaquita Marina. Now you know, when you come to Delphinus, you can be sure that you’ll be swimming with dolphins that were born and raised under our care and that we also have the experience to protect other marine species.